When it comes to hair removal, waxing scares me. A lot. I am petrified of the pain it appears to bring, but I decided to bite the bullet and agree to give the Veet Easywax Roll On Kit a try. 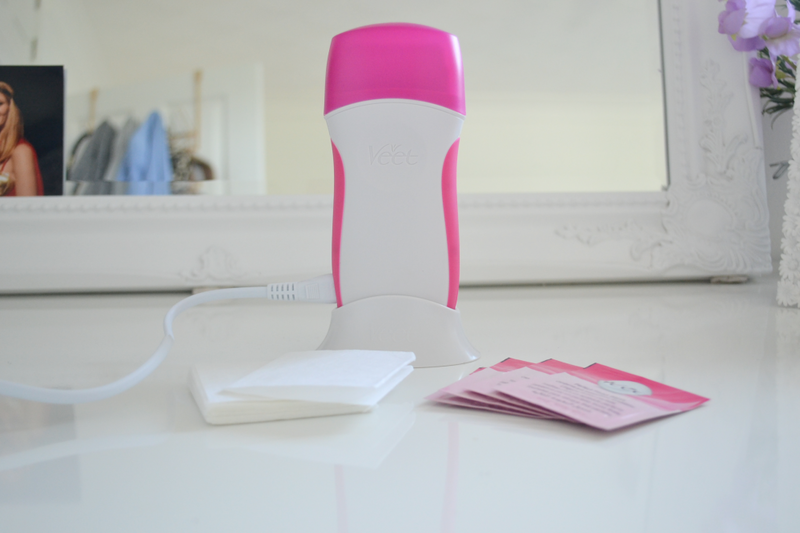 The veet roll on kit gives women like you and me the chance to give waxing a go at home. I let my leg hair grow out, admittedly probably not quite enough and set up. All you need to do in preparation for waxing with the roll on kit is allow around 20-30 minutes for the wax to heat up. Once heated up the wax has melted enough to roll onto the skin. I found this super easy – the wax was neither too cold nor too hot that it was unconfortable, it was just right. Although I did find it needed more than one layer. Once you’ve glided the wax on you slap a peice of the waxing paper on top and smooth it down, leaving a little bit at the bottom to get a hold of. Next is the scary part. Hold on to the skin and rip it off, the quicker the better. Although painful I think this is definitely something I could deal with doing if it means hairless legs for longer. I did struggle at first because my leg hair was so short but it definitely did the job on some patches. Surpisingly, despite the pain, I really enjoyed my first home-waxing experience and I look forward to giving it a go when my leg hairs inevitable grow to the length similar to apes, the veet electrical roll on kit was mess free and easy. A few more rounds of pain and I’ll soon be a home waxing pro. "REVIEW: Batiste Stylist XXL volume spray"